Two Main Floor Bedrooms, Master in the Loft, Easy Access, Broad Paved Driveway. Central between Bryson City and the Nantahala River for Whitewater Rafting, Hiking, Ziplining, Boating, Kayaking, Biking, Horseback Riding, Scenic Drives and so much more. "Sunrise in the Smokies”-- An unforgettable view will be yours from this mountainside haven. This deluxe 3 bedroom offers upscale furnishings, seclusion, a fire pit, Wi-Fi, an Xbox 360, and more! With easy motorcycle access and a broad, paved driveway, “Sunrise in the Smokies” is between downtown Bryson City and the Nantahala Gorge, and just minutes from Fontana Lake. 3 Bedrooms & 2 Baths: The first bedroom in the loft has a queen bed with private bath. The second and third bedrooms on the main floor each have a queen. The second bathroom is a full bath with a tub and shower combination. 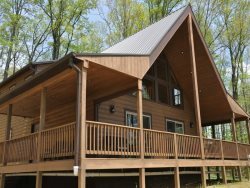 This gorgeous cabin is equipped with stainless steel appliances including a dishwasher. The spacious living room has clerestory windows, a stone gas fireplace reaching up to cathedral ceilings, and a leather sofa and loveseat. Enjoy the view from the fire pit, the porch with comfortable seating, or the hot tub. Grill from the covered porch, and we will provide the propane. Check out the video below of this cabin and the amazing view. Amazing cabin with awesome views. This cabin is very well furnished. Beds were comfortable. Everything was perfect. Coffee on the porch watching the sunrise was a good way to start the day. Hot tub and fire pit was a great way to end the day. Can't wait to go back. We will return as soon as possible for sure. What a great time. We went hiking around Deep Creek and around Down Town. We loved the cabin and can't wait to come back. Kelli Hoy was very helpful and she was extremely fast to respond to all my questions and concerns. Prompt responses to questions is a a great factor in the positive evaluations given over all. The cabin is very beautiful and certainly close to a home away from home! The Kitchen is awesome. Everything I needed pots and pans even down to the pancake griddle is in here. A beautiful cabin, great weather, and the awesome scenery. made our stay very memorable. Thank you for allowing us to have this time here in your cabin. WE had so much fun while here on vacation to see the leaves change. We loved the coziness of the cabin and can't wait to come back. Staff was very knowledgeable, professional, quick to respond to inquiries and very personable. Team members were very friendly and helpful over the telephone even helping to find things to do. The staff was very friendly and knowledgeable. They cheerfully answered any questions I had. And was very helpful with the reservation. The check-in process was very easy to follow, along with the directions we received to the cabin. Family get together. The weather was perfect! Highs in the 70's and lows in the 50's. We enjoyed the mountains, finding new places to see, and enjoying the leaves. So very beautiful this year! Enjoyed just spending time with dear Friends. Nantahala Brewery had the best beer. Pizza from Anthony's was great. The highlights were sitting on the deck watching the mountains and just relaxing. It was good to revel in this special paradise on earth. Perfect! Perfect! Perfect! The weather was sunny and in the 70's. We went to the Biltmore house -- we'd been there before but wanted to see the Fall Leaves & enjoyed the hour and drive. We went to Harrahs in Cherokee, and shopped in Bryson City. All local shops were fun to browse in Bryson City. The Nantahala Brewery was good. We hiked the falls loop at Deep Creek in the Great Smoky Mountains National Park. The locals were all very helpful and friendly. We ate at the cabin most of the time because it was so comfortable. Great view!! The fire pit was such a nice gathering spot to enjoy the view and listen to nature. We missed the full moon by night, but saw shooting stars! This was a family vacation before school starts. We usually go to the Outer banks. This was perfect. Lower 80s daily and in the 60s at night. No rain at all. We enjoyed the "smoke" over the mountains. On the first day we enjoyed the surroundings, hot tub and had dinner at the cabin. On the second day we went tubing at Deep Creek. We lost our car key, but luckily have a spare! We met a ranger at Deep Creek. He opened our vehicle. We also lost a pair of Oakleys. We had a bonfire in the fire pit. On the third day we went to Cherokee and Mingo Falls. We took a lot of selfies at Mingo Falls. Next we went on to the Biltmore Estates. I try to imagine going back in time and mingling with the Vanderbilts and guests as I walked inside the house!!! Our favorite moments were having quality time with the family at this amazing, gorgeous cabin. Thank you to the owners! You have a paradise and a perfectly designed cabin here. We really love the layout of this house because it brings family closeness and conversations ... Beautiful wood and dcor all over. Fell in love the moment we saw the pictures online! We booked it right away. Would love to come back again for the "Fall" season.